Our durable gray Metal Framed Service Counters are great for any retailer needing a service counter to assist their customers. 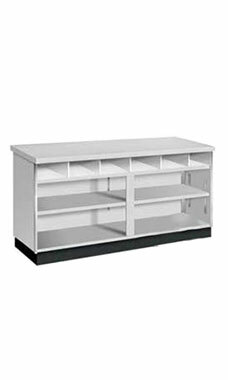 Featuring a functional multi-purpose design, this 48" service counter contains adjustable rear storage shelves and bag bins, offering a place to house tools, supplies, store essentials and bags, so that employees can quickly and efficiently attend to customers. The counter's 34" high top surface complies with ADA guidelines, and it contains finished sturdy 3/4" top, sides, shelves and front lower panel. Constructed from a gray melamine laminate finish, the counter features aluminum frame around it to add a sleek modern look to any retail business. Complete with a recessed black kick-plate. Overall measurements include: 34"H x 24"D x 48"L. Ready to ship.